Do you and I run in the same circles? Although we do share at least one circle: teaching. Right? And if you and I happen to be at a get-together together, and we knew we shared that circle called "teaching," we'd have something to talk about. We might even seek each other out to talk about it. Heck, we might even share some other circles, too... How about the "morning coffee" circle? Are you part of that one? Or the "Jack Reacher fan club" circle? Or the "fantasy football" circle? What about the "I'd rather gouge my eyes out than watch Real Housewives" circle? So even though you and I don't know each other, we have some things in common. We share some circles. It's a similar situation with our class at the beginning of the year. Unearthing those commonalities is something we try to facilitate, so that students seek out and build new friendships, and strengthen old ones. This year, try this fresh get-to-know-you activity with your class: I call it, "Who's In Your Circles?" It gets kids up and moving, finding out about those common interests, but in a non-threatening way. 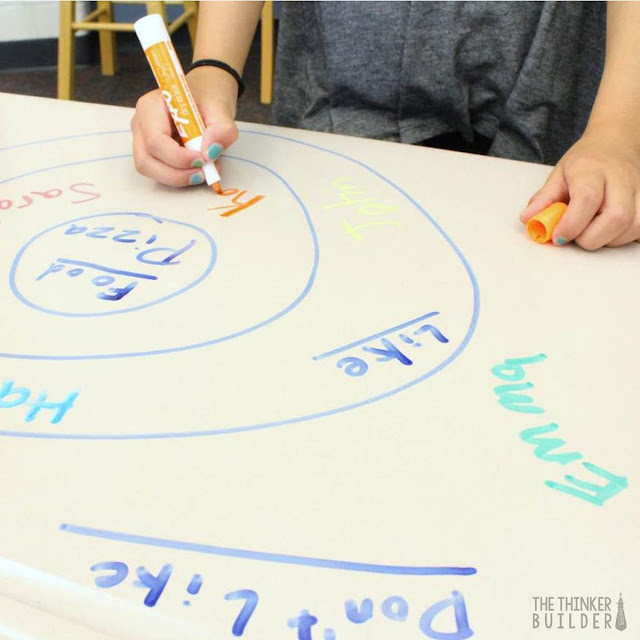 First, have students draw three concentric circles on their desk with a dry-erase marker. (Or, a piece of blank paper and a pencil works fine, too!) There should be a nice-sized gap between each circle and a little room outside the outer circle. 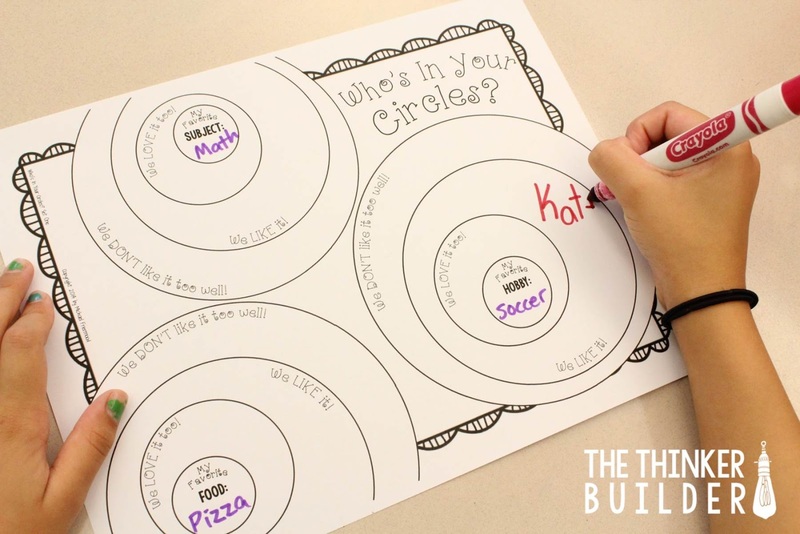 Now tell students how to label their circles: the inner-most circle will be the Topic, like... favorite food, favorite subject, favorite hobby. In the photo above, the topic is "favorite food," so the inner circle is labeled, Food. 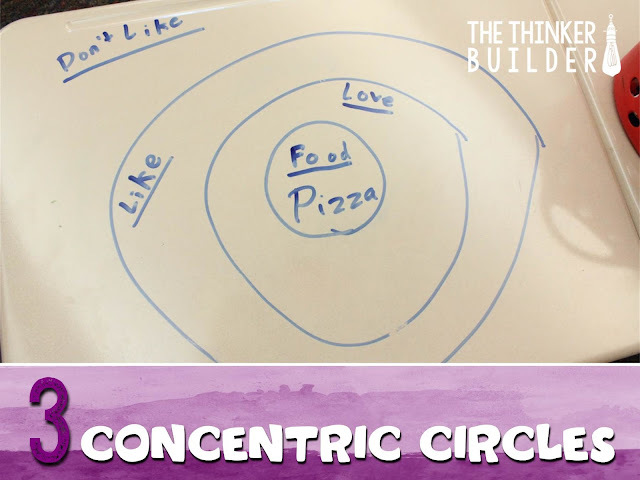 The next circle gets labeled Love, the third circle gets labeled Like, and the space outside the third circle gets labeled Don't Like. Be sure each student has a name tag on his/her desk, and if they don't, just have them write their name in the corner of the desk. 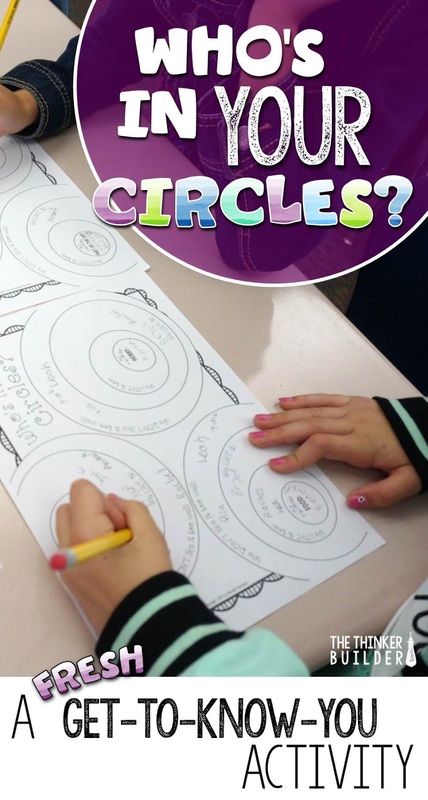 Next, have students fill in their own inner circle with their answer to the topic. In the photo above, you can see this student--let's call her Addy--wrote "pizza." At your signal, students will leave their own desk, bring their dry-erase marker with them, and visit other students' desks. Let's say Kate visits Addy's desk. Kate reads that Addy's favorite food is pizza. Now Kate decides if she loves pizza, likes pizza, or doesn't like pizza. Kate loves pizza, so she writes her own name on Addy's desk, inside the Love circle. Then Kate moves on to other desks. After students have had time to visit most of their classmates' desks, bring them back to their own desks to have a look at all the names in their various circles. Addy sees that Emma does not like pizza. Really Emma? Who doesn't like pizza? But Addy also sees that Sarah and Kate both love pizza. Sweet! Maybe they can have a pizza party together this weekend! 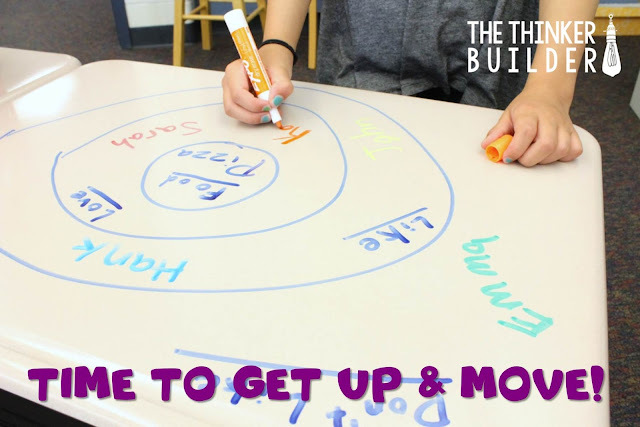 After a couple of minutes, have students erase their desk and and start a new round with a different topic! I have pre-made "Who's In Your Circles?" sheets that work great for this activity. 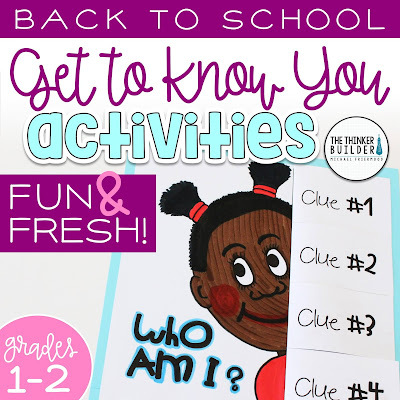 Each page has three topics (two pages worth, so six total topics) to help students get to know each other better! 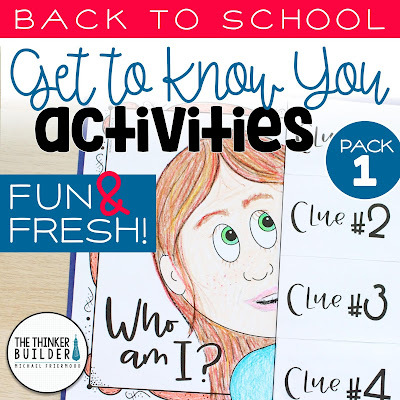 These activity sheets are part of my popular Back to School Activities, designed for grades 3-5. Or check out my grades 1-2 edition! 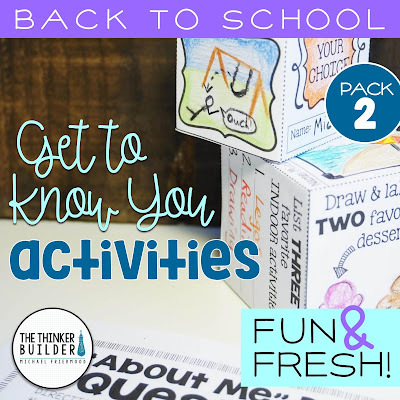 Both packs are filled with fun and fresh get-to-know-you activities. Click the images below for details. I also have a second pack for grades 3-5. Whatever activities you use, I hope your back-to-school season goes GREAT!